As the U.S. and European Union trade negotiations unfold, the two sides have competing perspectives over what will be discussed: The U.S. has included agriculture in its Summary of Specific Negotiating Objectives, while the EU has not. 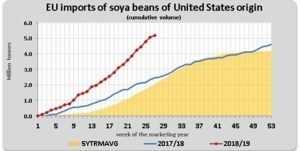 Despite the discord, recent trade data indicates that the EU has purchased an increasing amount of U.S. soybeans. Meanwhile, Bloomberg News reported Friday that Chinese negotiators made a “buying spree offer” during the U.S.-China trade discussions earlier this month in Beijing. A Joint U.S.-EU Statement on July 25th noted that, “We met today in Washington, D.C. to launch a new phase in the relationship between the United States and the European Union – a phase of close friendship, of strong trade relations in which both of us will win, of working better together for global security and prosperity, and of fighting jointly against terrorism…This is why we agreed today, first of all, to work together toward zero tariffs, zero non-tariff barriers, and zero subsidies on non-auto industrial goods. We will also work to reduce barriers and increase trade in services, chemicals, pharmaceuticals, medical products, as well as soybeans. Wall Street Journal writer Emre Peker reported on Friday that, “Efforts to unlock agricultural markets previously got bogged down over safety and food-quality standards, among other differences. The EU has resisted opening up to genetically modified produce from the U.S., while the sides also differed on prized European geographical indicators that protect brands such as champagne, Scotch whisky and Parma ham. Meanwhile, Brussels and Washington had also failed to breach gaps in accessing each other’s government procurement markets–an area where the EU is typically very strong. 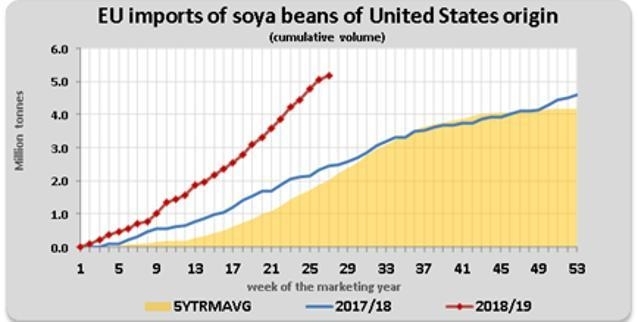 A press release earlier this month from the European Commission stated that, “Imports of U.S. soya beans by the European Union increased by 112% over the current market year (July-December 2018), compared to the same period in the previous year. 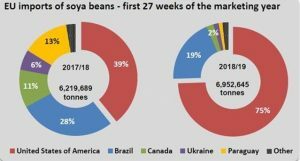 With a share of 75% of EU soya beans imports, the U.S. remains Europe’s number one supplier. “United States is Europe’s main soya beans supplier with imports up by 112%,” European Commission – Press release (January 7, 2019). 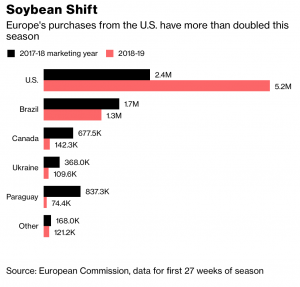 “After Snatching Up U.S. Soy, Europe Expects to Buy Even More,” by Megan Durisin (January 7, 2019).